From left, Scott Bowers fills in on bass, performing along with legendary guitarist Mike Wilhelm at the Blue Wing Blues Festival last week. Photo by T. Watts. UPPER LAKE -- Despite the absence of regular bassist Jon Hopkins, the Lake County Blues All-Stars opened the Friday version of the 2008 Blue Wing Blues Festival with a slammin' set of blues featuring great vocal stylings by 1960s legend Mike Wilhelm and Neon, who is rapidly climbing the vocal blues chops ladder. Working from the songbooks of Freddie King, Muddy Waters, Robert Johnson, Jimmy Reed, B.B. King and others the All-Stars delivered a solid set. The versatility of Mike Wilhelm's playing was evident as he alternated between rhythm and lead licks. He picked up a National Steel Resonator guitar halfway through the set and gave the crowd ample evidence of why Jerry Garcia called Wilhelm his favorite guitarist. I can't leave out Jim Williams' contribution. He contributed several stinging solo's which left some folk's open-mouthed. Kudos also to Scott Bowers filling in on the bottom for Jon Hopkins on a moment's notice. If you'd like a little taste of the Lake County Blues All-Stars, they play Blue Mondays at the Blue Wing frequently. Friday Night headliners, the Ford Blues Band with Patrick Ford and Volker Strifler are connected musically all over the world. 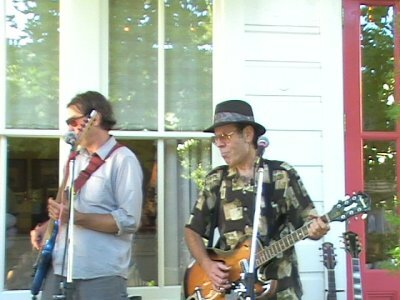 Patrick Ford's brothers, Robben and Mark, have made individual high water music marks as well. To start, the band ripped through three up-tempo harp-driven, guitar-fueled numbers and quickly had the crowd on its dancing feet. Harp man Andy Just was smoking. Bassist Dwayne Pate anchored the bottom pocket while Patrick Ford's beat was cool and steady. Volker Strifler played and sang amazingly well. His version of Howlin' Wolf's Spoonfull was very authentic. If there had been a vote for the festival's best guitar player, Volker would have been hard to beat. If you ever get a chance, catch this band live. They don't just cook, they sizzle!T. 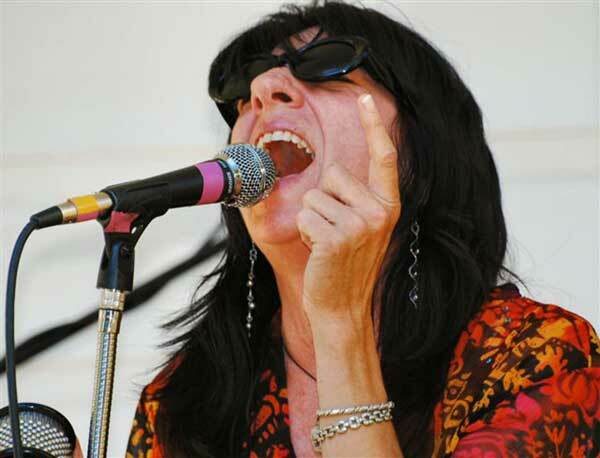 Watts writes about music and culture for Lake County News. Singer Neon and bassist Scott Bowers perform during the blues festival. Photo by T. Watts. T. Watts writes about music and culture for Lake County News. 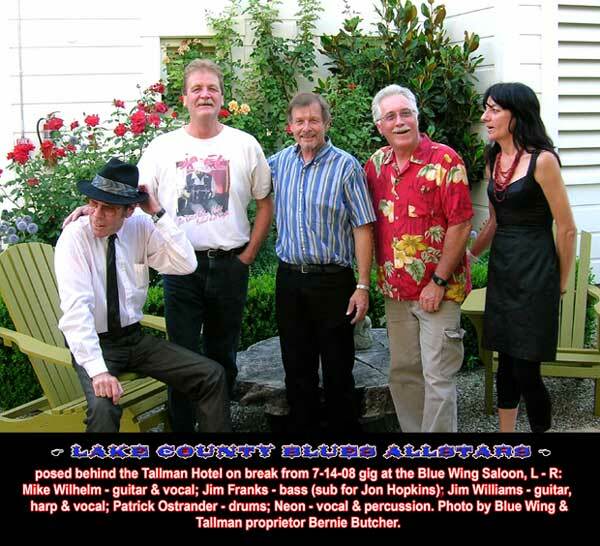 Summer Of Love Legend Mike Wilhelm and Lake Blues All-Stars featuring Jim Williams and Jon Hopkins were an early crowd favorite on Thursday night. Their set included Robert Johnson's "Love In Vain" and B.B. King's "Rock Me Baby." Hopkins, the "Barrister of Bass," did a fine rendition of Jimmy Reed's "Big Boss Man," playing bass and harmonica simultaneously. 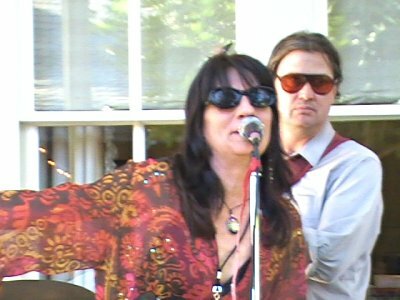 A female vocalist named Neon guested on "The Thrill is Gone" and "I'm Tore Down." When not singing she worked the crowd admirably and did great percussion work. Wilhelm displayed great virtuosity and chops in his note selection during his solos. The band closed with "Red House' and "Further On Up The Road" to a great ovation by the crowd. Great set! 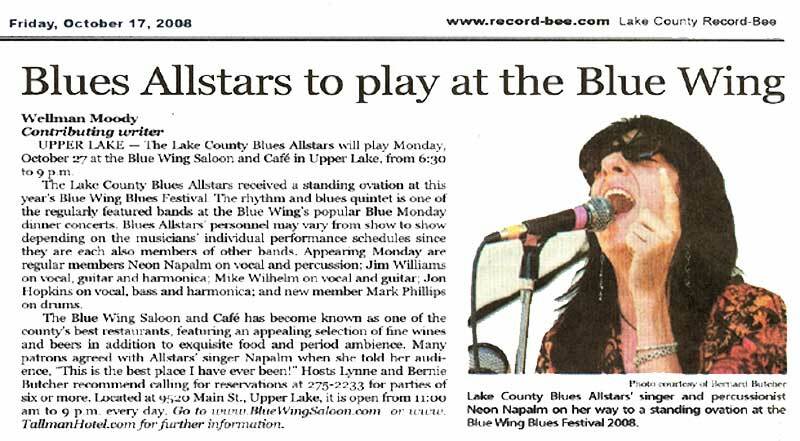 UPPER LAKE -- The Lake County Blues Allstars will play Monday, October 27 at the Blue Wing Saloon and Café in Upper Lake, from 6:30 to 9:00 p.m. 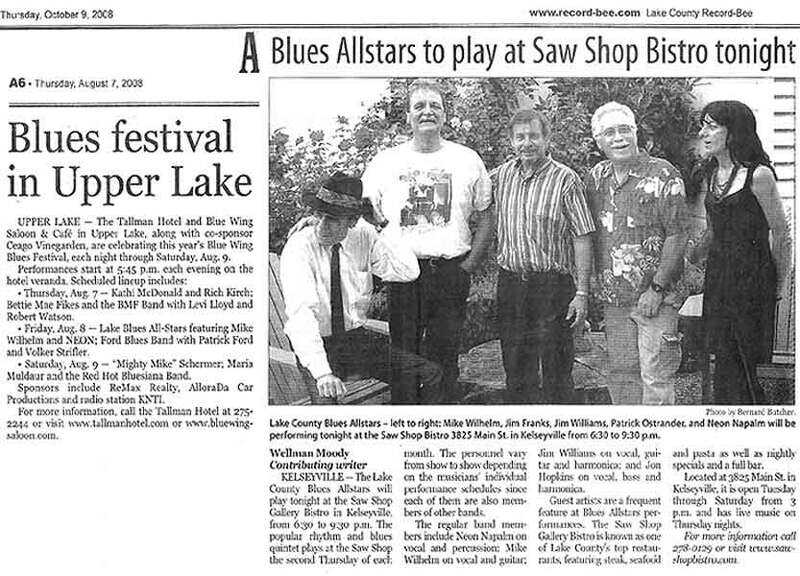 The Lake County Blues Allstars received a standing ovation at this year's Blue Wing Blues Festival. The rhythm and blues quintet is one of the regularly featured bands at the Blue Wing's popular Blue Monday dinner concerts. Blues Allstars' personnel may vary from show to show depending on the musicians' individual performance schedules since they are each also members of other bands. Appearing Monday are regular members Neon Napalm on vocal and percussion; Jim Williams on vocal, guitar and harmonica; Mike Wilhelm on vocal and guitar; Jon Hopkins on vocal, bass and harmonica; and new member Mark Phillips on drums. The Blue Wing Saloon and Café has become known as one of the county's best restaurants, featuring an appealing selection of fine wines and beers in addition to exquisite food and period ambience. Many patrons agreed with Allstars' singer Napalm when she told her audience, "This is the best place I have ever been!" Lake County Blues Allstars' singer and percussionist Neon Napalm on her way to a standing ovation at the Blue Wing Blues Festival 2008. Photo courtesy of Bernard Butcher.